Clever Bulletin: Nicki Minaj's Sacrilegious Grammy Date: The Pope or Just a Lowly Bishop? 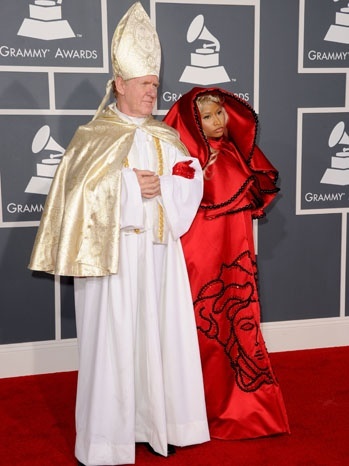 Nicki Minaj's Sacrilegious Grammy Date: The Pope or Just a Lowly Bishop? No Lady Gaga performance at the 2012 Grammys? Bummer. But wanna-be controversial rapper Nicki Minaj was happy do her best Gaga imitation. First she arrived dressed in a Gaga-esque Versace red cloak-cape outfit accompanied by some strange old dude dressed like the Pope but without the necessary papal headgear and ornaments. He was more likely emulating a lower level bishop or something. Then Nicki went on stage with that same poor guy, who seriously looked like he came from Central Casting, and began “fessing” the lyrics to her new single “Roman Holiday." It got even more annoying when the show cut to a a pre-taped segment with the same dude doing his best Exorcist routine. (Think vintage SNL: "Your Mother Eats Kitty Litter, Your Mother Sews Socks That Smell"). All the while, Minaj applied more lipstick and sang the lyrics to “I Feel Pretty." Seriously, not making this up. In case you fell asleep at this point, the show quickly flashed back to the Staples Center stage, adorned with enough stained glass to put Notre Dame and Chartres Cathedral to shame as Minaj was strapped to -- but eventually miraculously escaped -- some kind of of Hammer Studios Bride of Frankenstein table. There was a lot of pyrotechniques, popes, choir boys, stained glass and even Minaj elevating. What no speaking in tongues? Wait, maybe that was the rap lyrics. All of Minaj's sacrilegeous button-pushing is bound to annoy the Christian Right, the moral majority and make a few fleeting headlines. Was that the point? Tell us in the comments.